Places to see in Digha: The town of Digha is divided into Old Digha and New Digha. The beaches of Old Digha have all been submerged in the sea and the Govt. has protected the sea with boulders and concrete constructions. 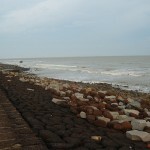 However, Old Digha offers a unique look, admired with huge stones and concrete steps. The beach of the recently developed area of New Digha just 2 km away has nice golden beaches. The beach of the New Digha is quite extensive and is still not exploited and maintained properly. The entire region of Digha is dotted with Casuarina groves. Nearby attractions around Digha: You can easily make a number of trips to the nearby destinations of Digha. Only 2 km. west of Digha is the pristine beach of Udaipur, along the border of Orissa and Bengal. Admired with Casuarina trees, the sight of the beach has some unique appeal to the tourists. You can also locate a delta nearby, which marks the confluence of the Subarnarekha River and Bay of Bengal. You can also make a trip to the famous temple of Lord Shiva in Chandaneswar, which is visited by millions of devotees during the Maha Vishuva Sankranti. Junput, Shankarpur, Mandarmuni and Tajpur are tourist hotspots, located near Digha. Another major tourist spot is Talsari, a delta on the Bay of Bengal, located at a distance of 6 km. from Digha. Things to do in Digha: Nothing can be more refreshing than enjoying a stroll along the scenic sea beach of this beach resort. You can also walk around the Casuarina plantation, stretching from Old Digha to New Digha. How to reach Digha: Digha is well connected by both roadway and railway with Kolkata. You can avail trains from both Howrah station and Satragachi railway station to reach Digha directly. Regular bus services to Digha are also available from Esplanade in central Kolkata and Howrah bus terminus. It takes about five hours to reach Digha by bus. Best time to visit Digha: Digha is suitable for visiting round the year. Lodging and dining facilities in Digha: There are plenty of hotels and tourist lodges in Digha. You can choose your accommodation according to your budget, as the place houses both cheaper and budget hotels and luxury lodging. You will also find a number of affordable eateries, locally called ‘’rice hotels’’ at Digha. Some decent restaurants are also found at the site. You can get vegetarian as well as non-vegetarian meals at the restaurant. Digha is the hub for fresh fishes. So you can relish some fresh catches like pomfret, prawn, parshe, hilsha etc. Can you provide me the contact details of a newly constructed hotel in new digha known as M Plaza.